Philosopher and historian of philosophy, after his high school studies in Matera he enrolled at the University of Florence (1904), where he finished his degree first in letters and then in philosophy, studying with Ermenegildo Pistelli and with Francesco De Sarlo, whose daughter he later married. He obtained his university teaching qualification, was awarded the chair of moral philosophy at the University of Messina, then taught history of philosophy in Florence (1924), where he was Dean of the Faculty of Letters from 1947 to 1953 and University Rector from 1953 to 1961. Author of a well-received manual for high schools, he was a member of the National Council for Public Education and a member of the Accademia dei Lincei. 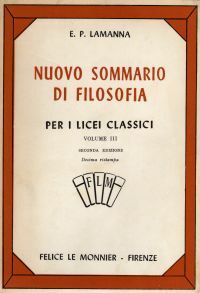 Main works: Etica e teleologia (Milano 1925); La mia prospettiva filosofica (Firenze 1961); Studi sul pensiero morale e politico di Kant (Firenze 1968). 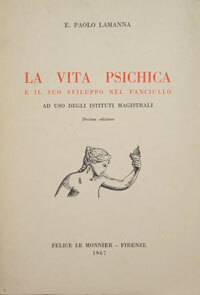 Bibliography: P. Piovani, Sulla prospettiva filosofica di Eustachio Paolo Lamanna, Torino, 1962; Ibid., Eustachio Paolo Lamanna tra etica e storia, Napoli, 1967; G. Martano, L'esperienza speculativa di Eustachio Paolo Lamanna, in «Filosofia», XIX, 1968; G. Calò, Il pensiero di Eustachio Paolo Lamanna, Napoli, 1971; Dizionario generale degli autori italiani contemporanei, Firenze, 1974, pp. 690-691; E. Pizzilli, Ricordo di Eustachio Paolo Lamanna nel primo centenario della nascita, «Bollettino della Biblioteca provinciale di Matera», 10-11, 1985, pp. 3-6; P. Donatelli, Lamanna, Eustachio Paolo, in Dizionario biografico degli italiani, vol. 63 (2004). The library of Paolo Eustachio Lamanna can be reconstructed on the site of the Tommaso Stigliani Provincial Library of Matera. Lamanna willed his books—about 2,000 volumes and journal extracts—to the library of his native town, and since then they have been kept in a dedicated room, for which there is no topographic catalogue. The only way to identify the works of the philosopher is to consult the online catalogue indicated above. To accede to the catalogue, type Lamanna into the box "ricerca libera". Of the 2,463 titles which appear, works by other authors with the same last name can be sorted out by choosing a title, then clicking on "Localizzazioni" and seeing if under "Provenienza" there is the note of it being of the Lamanna collection.